Imagine a steak without salt. Enjoyable, but missing something…. Drinking a top notch Italian wine without food falls into the same state of limbo. This was brought home to me yet again, at a Masterclass on Single Estate Extra Virgin Olive oil in Jamie Oliver’s restaurant in Dundrum, presented by David Gleave, MW, of Liberty Wines. David has spent 3 months in Italy every year since 1986. When he first brought single estate olive oil to London, he knew he had a fabulous product, but was unsure of how to sell it at such a high price. Rose Gray of the River Café was one of the very first to reach out for it. Her protegée, Jamie Oliver, followed suit (Fontodi is his choice). There are 1.2 million olive growers in Italy, and 624 varieties – just as much diversity as there is among wines. The 2016 harvest was very good in terms of quality. Tuscany was held to be the northern limit of production. Before Tuscany became well-known for wine, farmers in the area grew both grapes and olives on their land. Quite simply, olive trees were planted where grapes wouldn’t ripen. Now, fifty years later, many top producers make premium quality, single-estate olive oils, and pride themselves as much for their olive oil reputation as for their Chianti. Moraiolo and Frantoio are the main Tuscan olive varieties. One tree yields only about a litre. Quality has improved dramatically. David is quick to credit Luigi Veronelli for helping to shape a culture of quality for both wine and olive oil. Grapes are now harvested in small plastic containers rather than burlap sacks of old, and are brought to the press within hours. Crushing takes place in enclosed stainless steel containers (minimising oxidation), at about 25-27˚C, with the liquid oil being separated by centrifugal force. Before this the olives were crushed on mats between stones, and cold-pressed to release oil from the pulp. 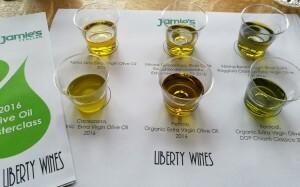 An olive oil tasting is much more challenging than a wine tasting, as David readily admitted. You need to warm the cup of olive oil in your hand, and then taste it. Very soon, the viscosity coats your palate. Extra Virgin Tuscan olive oil is a vibrant green, and comes with a peppery, grassy, fruity, lingering character, and is related, but altogether a distant, more aristocratic cousin to the version most of us cook with. Its oleic acid content (which gives buttery character) should not exceed 0.8%. Oils from the coast are lighter, and best enjoyed with fish. Oil from the Tuscan hills and the warmer South are richer, and better suited to steaks, beans and soups. Enjoy it fresh, as it starts to decay as soon as it’s pressed. Drizzle it on salad, bread, pasta or meat, for a slick of deliciousness, and enjoy with a large glass of any of these exquisite Chianti to chase any grey skies away! Look out for these single estate extra virgin olive oils in Jamie’s Italian Dundrum, Green Man Wines, 64 Wine, Ballymaloe Cookery Shop, Fallon & Byrne, Lotts & Co, Red Island, Terroirs, Ard Bia. Fontodi Chianti Classico 2012 is quite a fruity style; wonderful sour cherry. It makes beef sing with its grippy tannin and vibrant notes. €31.99 from Redmonds, Blackrock Cellar, The Corkscrew, Drinkstore, Egans Food & Wine, Green Man Wines, Jus De Vine, McHughs, Red Nose Wines, 64 Wine, www.wineonline.ie Fontodi Organic Extra Virgin Olive Oil 2016 is distinctly green in colour; aromatic, and complex, with punchy peppery and spicy notes, tropical hints, with lingering artichoke notes. €15.99 for 50cl. Selvapiana Chianti Rufina 2014 a very savoury, dry, herbal traditional style which really comes into its own with food. €22.99, Coopers, Drink Store, Fallon & Byrne, Green Man Wines, Thomas`s, 64 Wine, Sweeney’s Wines, The Corkscrew, Power & Co, Terroirs, La Touche, Clontarf Wines, Michael’s Food & Wine, Mitchell ‘s. Isole e Olena Chianti Classico 2013 Dry, cocoa-like tannins, then a mini-explosion of fresh tobacco, savoury woody notes, just-ripe mixed black/red fruit behind, sandalwood, vague hints of sweet spice. Fabulous. €33.99, from Jus de Vine, Red Island Wine Co, Wineonline.ie, Green Man Wines, 64 Wine, Terroirs, The Corkscrew, On the Grapevine, Fallon & Byrne. Barca Reale di Carmignano 2014 powerful, firm, very well-priced quality Tuscan. Balanced, with cherry, plum and savoury notes. €22.99 from Redmonds, Jus de Vine, Blackrock Cellar, The Corkscrew, Green Man Wines, Fallon & Byrne, Grapevine, 64 Wine, Sweeney’s, Thomas`s, www.wineonline.ie. Capezzana Organic Extra Virgin Olive Oil 2016, from the same estate, is quite lemony, peppery, rich and round, coming from a warmer site closer to the coast. €28.99.